What’s it like playing an augmented-reality game on the Microsoft HoloLens? Expect it to be a much more physical experience than virtual reality, a HoloLens developer says—and possibly a bit hotter, too. Microsoft has already unveiled some of the first games and apps arriving on the HoloLens, and the developer edition has begun shipping. While Microsoft didn’t allow us to test the HoloLens ourselves, David Dedeine, who oversaw the development of the HoloLens games Young Conker and Fragments for Asobo Studios provided some insight. He says gamers should expect exploration and activity when playing Microsoft’s holographic peripheral. Young Conker, for example, has users essentially leading a smartass squirrel via one’s gaze, collecting coins and evading enemies. 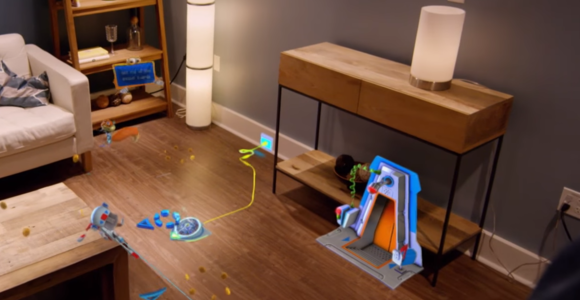 The HoloLens will scan and construct the level based on the your room you’re playing in and the objects inside it. The kicker: With a different room, there’s a different layout. In Fragments, a crime investigation game, you’re asked to poke around the room, manipulate virtual objects, and talk to virtual characters.